In Plumb Modular Furniture system, users can build various furniture structures with a set of modular components, and also they can adjust or transform the structures according to their changing situations. For instance, people can expand their shelves, modify a chair into a children's highchair or they even can transform a table into a shelf by changing some components just like they build and modify LEGO structures. Modular approach has been already common and successful especially in shelving systems. What I am trying to do in this project is expanding the flexibility to broader types of furniture beyond just vertical and horizontal grid modular structures. Furniture is no more fixed purpose, bulky object until the end of its life span in Plumb Modular Furniture system. Tidy up your life from Vitsœ on Vimeo. 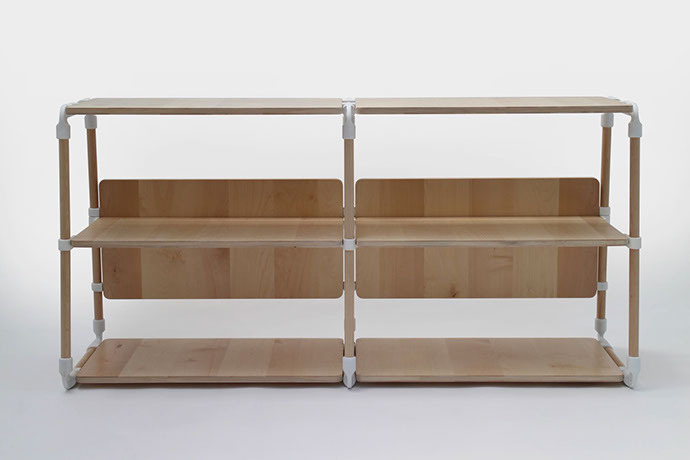 I had a chance to see the 606 Shelving System (1960, Dieter Rams) with many other shelves at the exhibition, Martino Gamper: Design is a State of Mind (2014, Serpentine Sackler Gallery). There were lots of shelves from a very functional warehouse shelf to some artistic designer shelves, and I was so impressed that the 606 System didn’t look outdated at all, though it was designed more than 50 years ago. Actually it looked most contemporary for me among all the other shelves mostly designed later than the 606 System. I think the flexibility of 606 System’s modular structure is one of the major factors that make it timeless. People can start with just one module of the shelving system and expand it later when they have bigger collection of books. The system also can be adjusted according to the users' changing situations whenever they move. I could think deeply about the value of timeless design thanks to this 606 System. I realised that making products last longer both physically and emotionally is another way of making products sustainable. 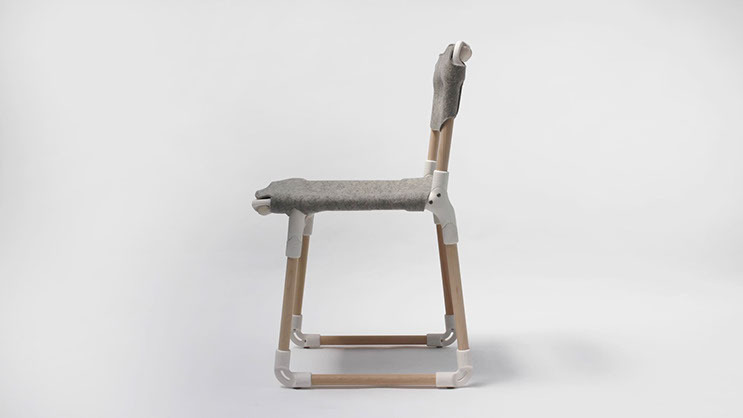 I think flexibility can play an important role in making products timeless and the timelessness can be an indirect but fundamental solution for sustainable design. As background researches, I studied existing examples of modular or adjustable products such as USM Haller modular shelving system (Fritz Haller, 1963), Tripp Trapp (Peter Opsvik, 1972) - adjustable children's chair, Phonebloks (Dave Hakkens, 2013) - a modular smartphone, now Google is working on it in the name of Project Ara, and LEGO (Ole Kirk Christiansen, 1949) including the 606 Shelving System. 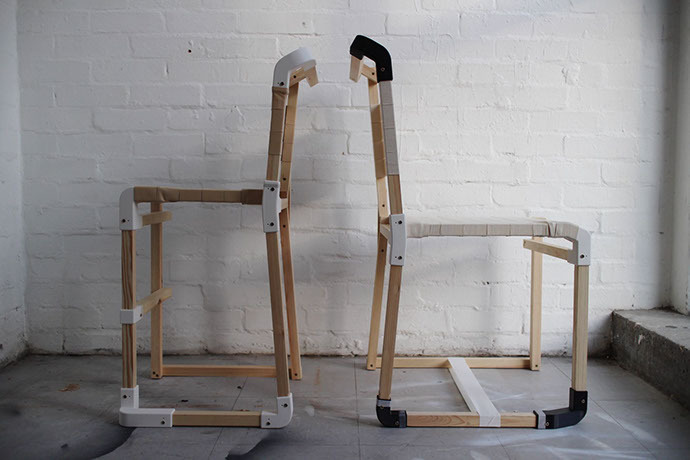 In this January, I built rough prototype chairs to check if I can make seatable objects with timbers and plastic connectors. At first I 3D printed a set of connectors for one chair, but I made 2 chairs (v.0.5) by building just half sides of each chair with those connectors and building the rest sides just with timbers and screws because I wanted to show the possibility of flexible transformation between a normal chair and a children’s highchair. After that, I built one complete chair (v.1) with those connectors and had used the first prototype at my desk for several months since January as a kind of a reliability test. I didn't give a rough ride nor treasured the chair, and it had lasted until I had to disassemble it after my graduation show. After making the first chair prototypes, I started to improve connectors. In the end, I designed centre-flat-shaped connectors to minimise material use and the flattened centre area could be used for coupling connectors seamlessly. I also tested divers ways of connecting joints with timbers effortlessly, then I tried to design each furniture structures by making small scale models of them. 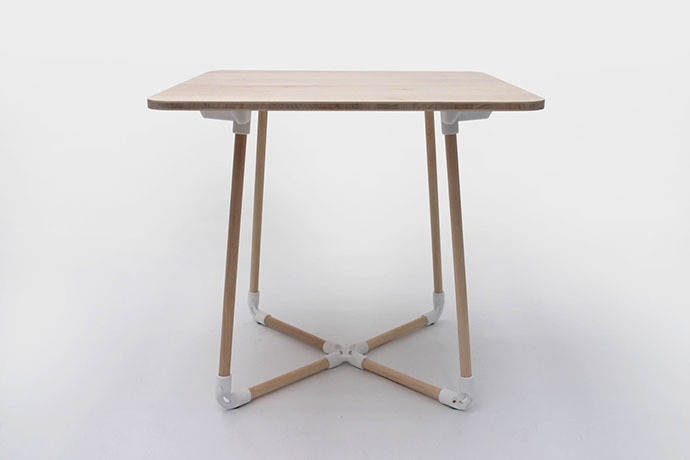 Current Plumb Modular Furniture system consists of wood structures, plastic connectors and connector couplers. Connectors are universal and can be shared among various structures. Basically there are 3 types of angled connectors - 83°, 90° and 97°. 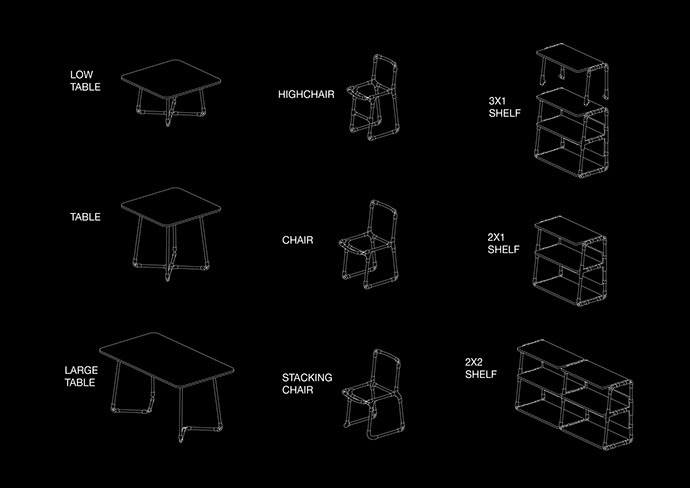 They make chair angles and enable structures to go beyond 90° grid. On the other hand, connector couplers are not universal and dedicated for specific structures. 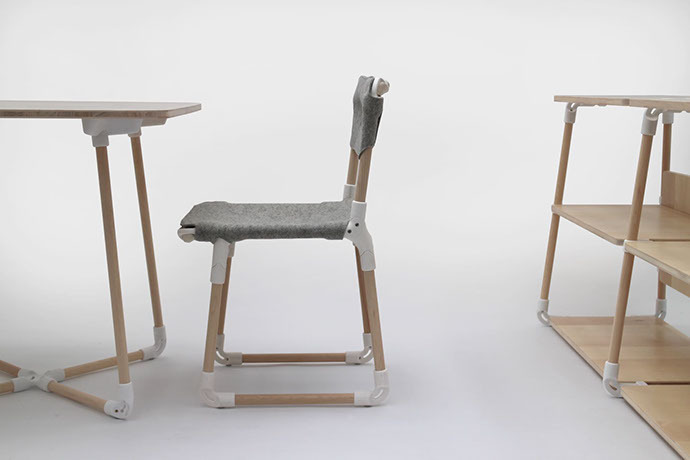 The connector assembly which consists of universal connectors and a dedicated connector coupler is Plumb Modular Furniture’s unique solution for finding a balance between universality and aesthetics. 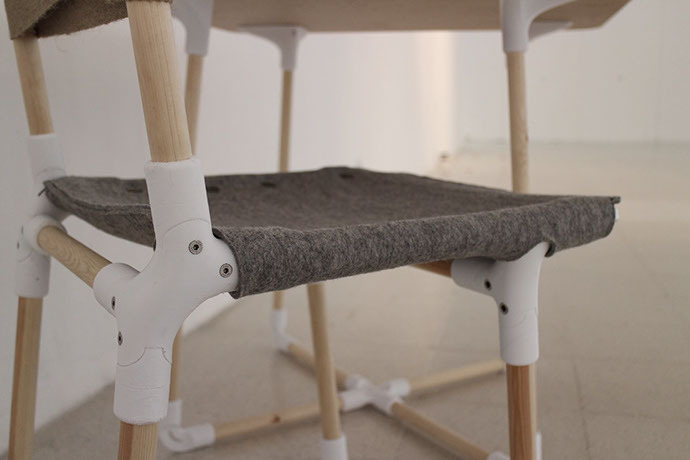 I tried to achieve unprecedented flexibility in furniture building even including chairs, so that people can use it for life by adjusting it according to their changing situations. 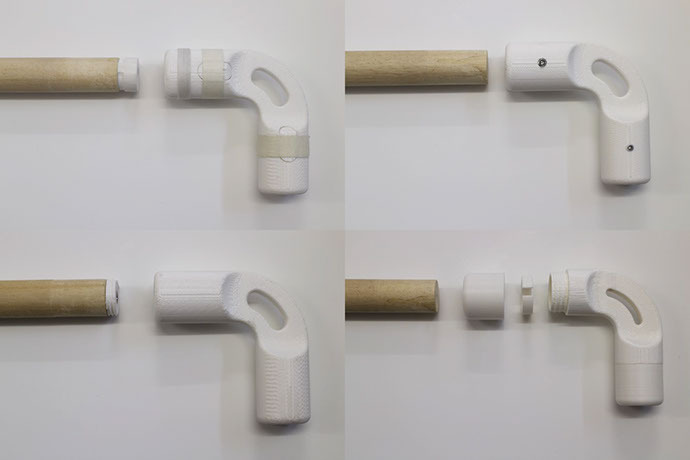 I designed a wood and plastic version as my graduation project and I used 3D printers for making these prototypes, however current versions of Plumb Modular Furniture are designed in consideration of mass production with injection moulded connectors because I thought the products can be more affordable and reliable in mass production condition for the present. I am going to test an open source version which can be easily printed and built by the general public for a while. Later I would like to try a metal version made with aluminium connectors and tubes and I think that might look much more refined and seamless without current prominent shapes and finishings of the connectors.